"A wonder player, no matter his position ( except goal!). He takes pride of place over the many great football personalties of the present, principally because of his versatility and his ability to give a top class performance, no matter the occasion, be it for team or country. He has a natural eye and feeling for a ball and I doubt if anyone can clip a ball so hard and direct with either foot. In fact he is so adept with both right and left that it's difficult to judge that he's a natural right. As a full-back his positioning and tackling – where does he get the strength in the tackle for one so slight in frame – are unexcelled." 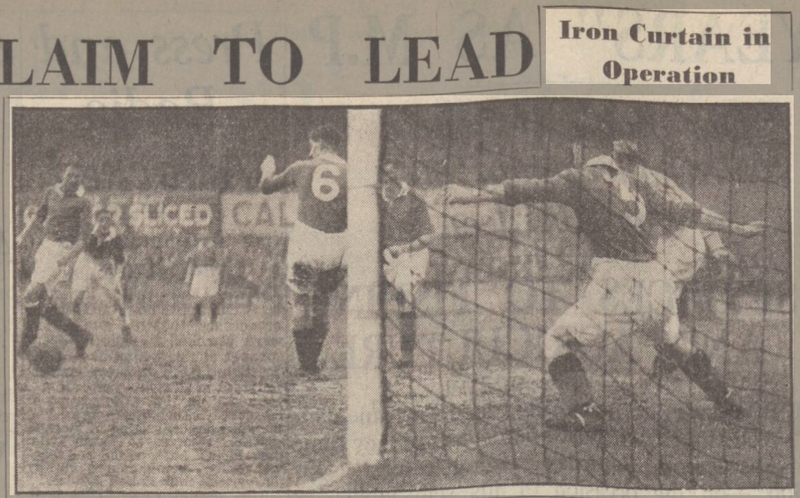 Not the words of your average sports journalist writing a newspaper column critiquing a footballer, but those of the Evening Citizen's Willie Waddell in a 1955 column which was devoted to an integral part of Rangers famous 'Iron Curtain' defence, Sammy Cox. Waddell was perfectly qualified to pass comment–he appeared in the same Rangers starting XI as Sammy on no less than 230 occasions. An Ayrshire man from Darvel, Sammy Cox had spells with Queen's Park and Dundee as an amateur during WWII, but it was when hostilities ceased and league football was re-instated in the summer of 1946 that Sammy took the "professional ticket" as the Dundee Telegraph put it and signed for Rangers. It was rumoured prior to his signing in the same newspaper that he could make the switch to Shawfield and sign for Clyde, however the Dundee based reporter obviously knew Sammy well as he signed off his article saying, "If Sammy has made up his mind to go to Ibrox he'll take some shifting!" Some shifting from Ibrox was an understatement, for Sammy was to become a mainstay in the Rangers first team for the next nine years, making history in the process as part of the fabled Iron Curtain defence and being part of the Rangers squad which won the very first ever Scottish domestic treble. 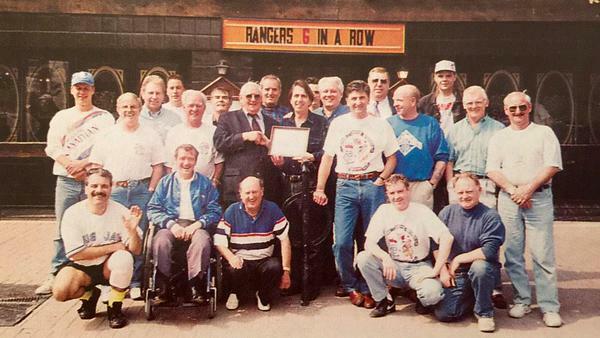 The Squad which helped Rangers win football's first treble. Sammy would be one of the last two chinks in the armour of the Iron Curtain defence to be put in place. He signed on the same day that Goalkeeper Bobby Brown was signed from Queen's Park on 2 May 1946. The famous back line of Brown, Young, Woodburn, Shaw, McColl and Cox was complete. Sammy signed his professional forms for Rangers in his native Darvel in the home of another Rangers Darvel Marvel, Alex Smith, who gave the Club 21 years service between 1894 and 1915 before retiring back to the Ayrshire town in 1915. Darvel has a great history of producing history making Rangers players: the first Darvel Marvel was Nicol Smith, part of Rangers first ever Scottish Cup winning side in 1894. 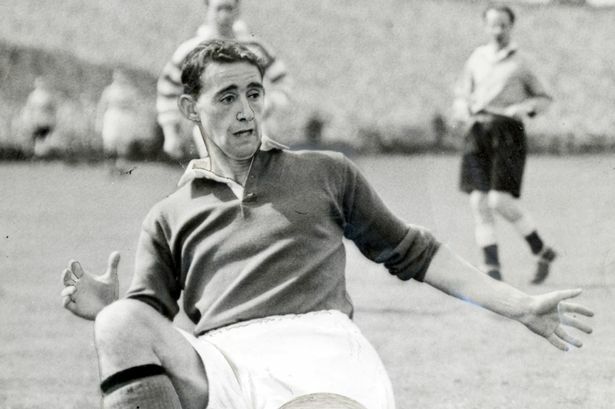 In his nine year spell at Rangers, Sammy played 310 competitive matches and scored 18 goals. His first season saw him play 13 matches in 4 different positions; his second he played in every league match, including a stint as a left-winger, and won his first Rangers honour playing in a Scottish Cup Final victory over Morton. But it was his 'strength in the tackle' as Wille Waddell described it, that saw him cement the left-half position. With George Young switching to Right-Back, Ian McColl at Right-Half, Tiger Shaw at Left-Back behind Sammy and Willie 'Big Ben' Woodburn at Centre-Half, the Iron Curtain took shape with Bobby Brown as Goalkeeper and laid the foundations for the side that would win football's first ever domestic treble in Season 1948/49. Sammy missed only one league match during that historic season when the League was won by just one point over his former club Dundee, his one and only League Cup winners medal came in a 2-0 win over Raith Rovers and his second Scottish Cup winners badge coming courtesy of a 4-1 victory over the club he was rumoured to be joining, Clyde. The famous 'Iron Curtain in Operation.' Brown, Woodburn, Cox, Shaw and McColl all in the shot. As well as a historic year for Rangers, it was a historic year for Sammy. Added to the three winners medals he picked up, he won the first of his 24 Scotland caps playing as an inside-forward in a 3-0 defeat against France in Paris. Just like with Rangers though, the abilities described by Willie Waddell saw him moved to left-back for Scotland, which made for perhaps his finest moment in the dark blue, a 3-1 Scots victory at Wembley in 1949. Sammy was up against the famous Stanley Matthews, the greatest winger the world had seen. But not that day. 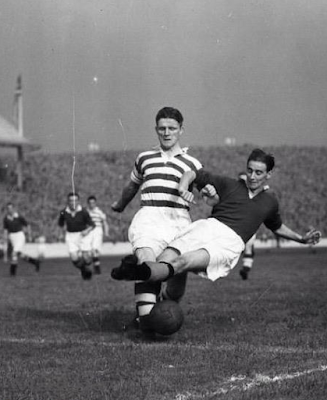 He had met his match in Sammy Cox of the Rangers and Scotland. My grandfather tells me that the only time Matthews got past Sammy in that match was on the way up the tunnel at half-time; Waddell put it more eloquently: "Stanley Matthews will tell you of Cox's ability at left-back because Sammy gave one of his most brilliant performances against the English winger." 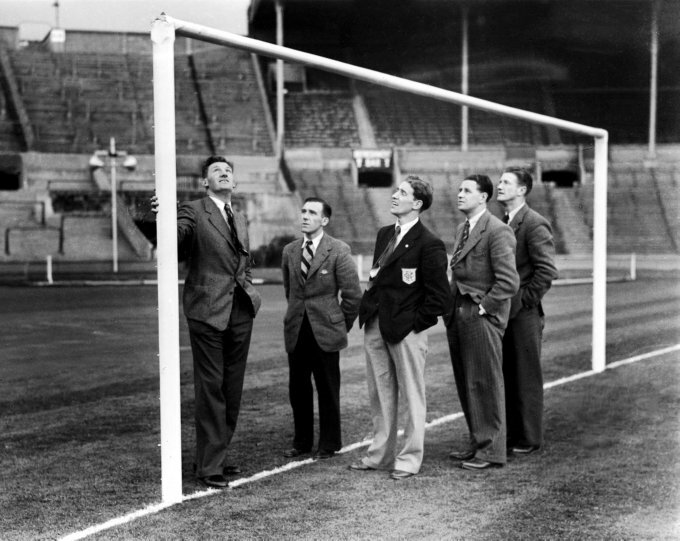 before tucking Stanley Matthews in his blazer pocket. His nine seasons at Ibrox saw him amass 310 competitive appearances, 18 goals, three Scottish League titles, three Scottish Cups and one League Cup. On being part of Bill Struth's Iron Curtain, Sammy said, "In all honesty, Bill Struth did not know that much about football tactics, but he knew if you were playing badly! He put together the team and we took it from there. Jock Shaw and I used to decide who we were picking up and we just got on with it. I was lucky to be part of that defensive system." His record in matches against Celtic was sensational: in the 29 Old Firm matches he played in, he was on the winning side 18 times losing only six. 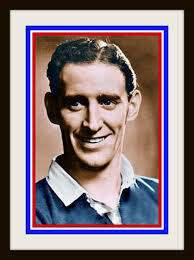 Sammy's Rangers career would come to end in February 1955 when he signed for East Fife. However, Sammy's relationship with Rangers would continue long after his retirement from football, far away from Govan and his hometown of Darvel when emigrated to another continent. 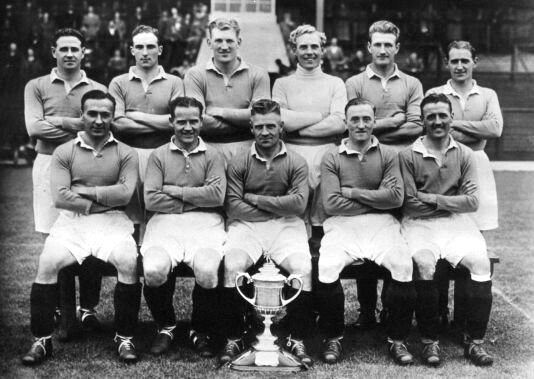 The famous Sammy Cox of the Rangers would become a celebrated figure in his new adopted country of Canada, and became a cherished member of the North American Rangers Supporters Association. Lindsay Herron writes in his book, The Official Rangers Hall of Fame, "If you happened to bump into any Rangers supporters in Canada and mentioned the name Sammy Cox you would immediately command their undivided attention." And that's exactly what close friend John Miller gave Sammy when he first met him at the Scots Corner Pub, home of the London Ontario RSC in 1994. John explains, "I did not recognise him at first. Well, our Clubhouse started buzzing, the word passed that that was Sammy Cox, I had to pinch myself. Sammy Cox here? It can't be, but it was him in the flesh. He had a black bin bag with him, and after the match he emptied the bag onto two tables. It contained numerous Scotland shirts and caps along with a whole bunch of medals. We stayed there for over two hours as Sammy spoke of his days at Rangers. This started a great relationship with Sammy and our Club, and very soon after with NARSA. Sammy and his dear wife Jean visited many RSCs throughout Ontario and attended many NARSA conventions. 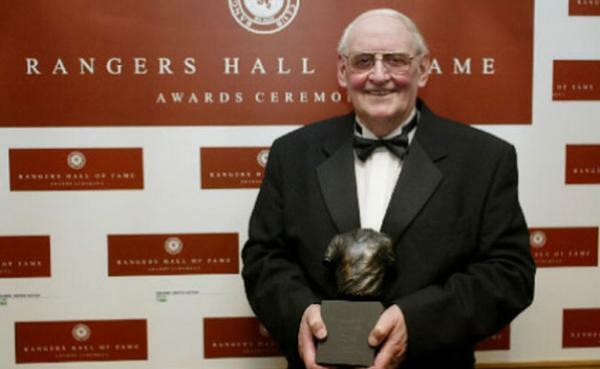 Here he got to meet up with hundreds of fellow Bears who loved to hear all his stories of his heydays at Rangers." Upon induction into the Rangers Hall of Fame, Sammy said, "When you walk into these Rangers clubs it's like walking into a bar in Glasgow. Close your eyes and you are there!" Miller continues, "When the likes of John Greig, Ally McCoist, John Brown and Sandy Jardine came over they would go out of their way to speak to Sammy." John talks of Sammy's illness and how the Rangers family at NARSA and in Glasgow pulled together to help him anyway they could, including a visit by Willie Henderson who had Sammy in stitches of laughter and more poignant moments when memories and photographs of his Rangers career were compiled by Sandy Jardine and Jim Hannah and sent over to Canada where John and Sammy's friends went through them page by page with him. "I was fortunate enough to be able to visit Sammy on the day he passed," Miller said, "where I revisited my time with Sammy from the first day I met him at our wee club in London Ontario." Miller finishes his tribute to his friend by saying, "Samuel Richmond Cox, you are a star and a Rangers Legend through and through. Thank you for making your time with us a rewarding experience, it was an honour." If you have a moment, raise a glass to the famous Samuel Richmond Cox: a Ranger of the highest quality; a winner and a history maker.